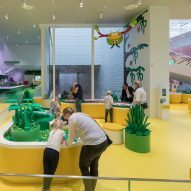 Bjarke Ingels' firm BIG has unveiled its new visitor centre for toy company Lego – a stack of huge building blocks, featuring brightly coloured patios that are home to a submarine, a shark and a camel. 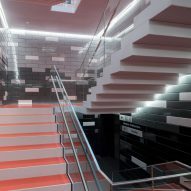 A pair of "pixelated" staircases allow visitors to scale the exterior of the Lego House to reach the patios, which are set atop 21 blocks shaped to resemble scaled-up Lego bricks. 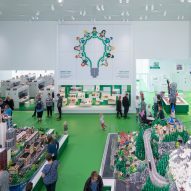 Copenhagen- and New York-based firm BIG designed the 12,000-square-metre centre to provide a new attraction for Lego fans in the company's hometown of Billund, Denmark. Its location, on the site of Billund's old town hall, also puts it in close proximity to the Legoland theme park. 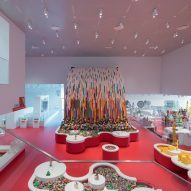 "Lego House is a literal manifestation of the infinite possibilities of the Lego brick – one that embodies the notion of systematic creativity and allows children of all ages countless opportunities to create their own worlds and to inhabit them through play," said Ingels. "At its finest, that is what architecture, and Lego play, is all about: empowering people to imagine new worlds that are more exciting and expressive than the status quo – and to provide them with the tools and the skills to make them reality." The brightly-hued terraces aren't visible from the plaza that surrounds the base of the building, and passersby instead see only the white ceramic tiles the structure is clad in. 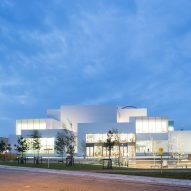 The plaza, steps and a square set into the centre of the building are open to the public, while huge Lego exhibition halls within the 12,000-square-metre building are for paying visitors. 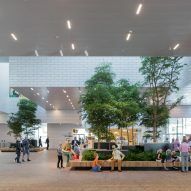 A tree made from plastic building bricks sprawls up through an atrium, which is wrapped by a staircase that links floors housing giant models of dinosaurs, whole cities and mountain ranges made from the toy bricks. 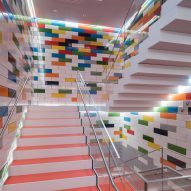 Like the roof terraces, the galleries are colour-coded using the colours of Lego bricks to create a way-finding system. Play areas on the first and second levels are divided up into red, blue, green and yellow zones, designed to represent different aspects of a child's learning process. 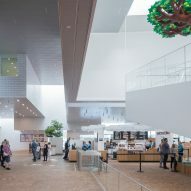 The uppermost floor of the building is home to the Masterpiece Gallery, which is illuminated by eight porthole skylights that mimic the shape of the stud-connectors found on the top of each Lego block. 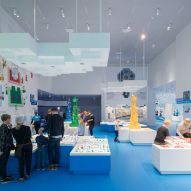 The gallery is used to display structures created by Lego fans. From its roof, visitors can take in 360-degree views of the city, which is where Lego was founded in 1932. 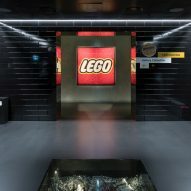 The lower floor hosts a gallery charting the history of Lego's brand, and a space named the Vault – set directly below the public square – where children and AFoLs (Adult Fans of Lego) can get a glimpse of the first editions of many of Lego's most famous building kits. Lego released a model kit of the Lego House to coincide with the building's opening. The 774-piece, 197-step kit replicates the stacked-block formation of the building and its brightly coloured terraces, which were captured in drone footage taken by Lego ahead of the building's completion. Bjarke Ingels, who is currently heading up his New York team, has plans to move back to his native Denmark later this year, where BIG is working on a pair of high-rise residential towers with spiky facades beside a new IKEA store in Copenhagen. Ingels, who came in second on the inaugural Dezeen Hot list, is also currently working on a new campus for Google in London with British designer Thomas Heatherwick.